Electric swaps are becoming more common, and that's a good thing. I'd be lying if I said that I can't wait for more Teslas to end up in the junkyard; but not for the reason you'd think. Electric cars are wonderful machines, and although many enthusiasts enjoy harping on EV drivers, it's likely that the majority of them haven't considered including electric in their next build due to cost or unfamiliarity—but that's starting to change. Meet Sam, the owner of a very particular Audi that some might call blasphemous above all else. But to me, it's both one of the most confusing and beautiful abominations ever created. Badged as an RS5 on the front grille but an S5 on the trunk lid, we're not entirely sure what this B8 generation Audi began life as. But we do know that the raw German V-8 powerplant was plucked from its original nesting place and something a bit more electrifying is now sitting under the bonnet. This story has the familiar ring of how electric supercar company Rimac planted its roots. In order to fit the electric motor and inverter, Sam sliced the unit in half and installed it into the engine bay, mating it to a custom 10.5:1 drive gear. For reference, a Tesla Model S has a 9.73:1 gear ratio, meaning that this change has made the car even zippier, albeit sacrificing some top-end speed in the process. 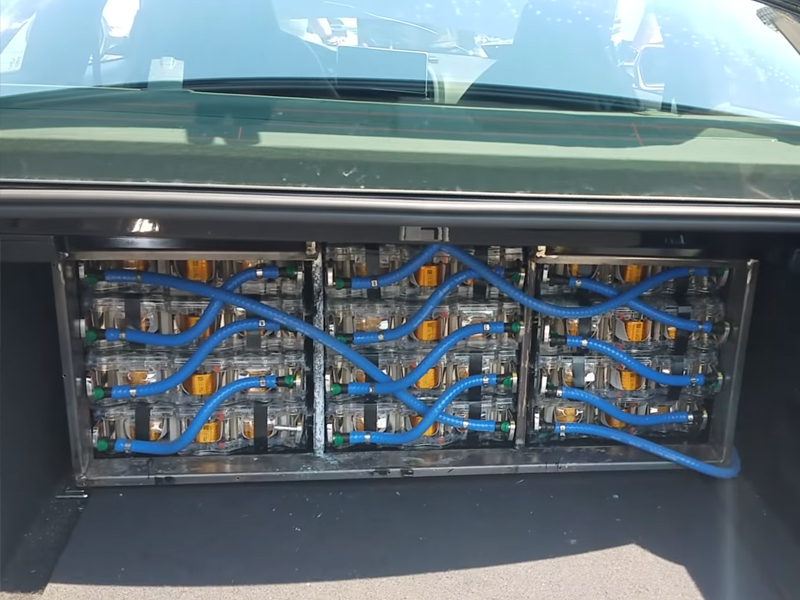 Additionally, Sam says that he made use of all 85 kilowatts from the donor Tesla by squeezing 16 battery packs into the car, even resorting to the back seat as storage. "It's really not that complicated," he joked. 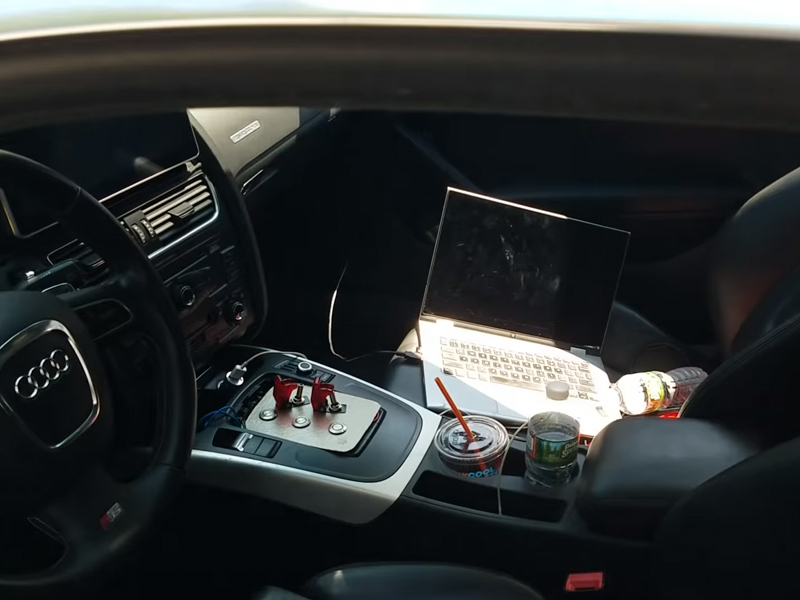 In case you're wondering who the man in the driver's seat is, that's Rich Rebuilds, a popular YouTuber who enjoys rescuing Teslas and restoring them to their former glory. This particular car isn't his, but judging by the amount of filming, there will likely be at least some sort of more in-depth look at the car later on. Until then, enjoy seeing the swapped car on a roller dyno. The run measured 359 horsepower, which seems rather on-point given the charge and what other little details we know about the build. 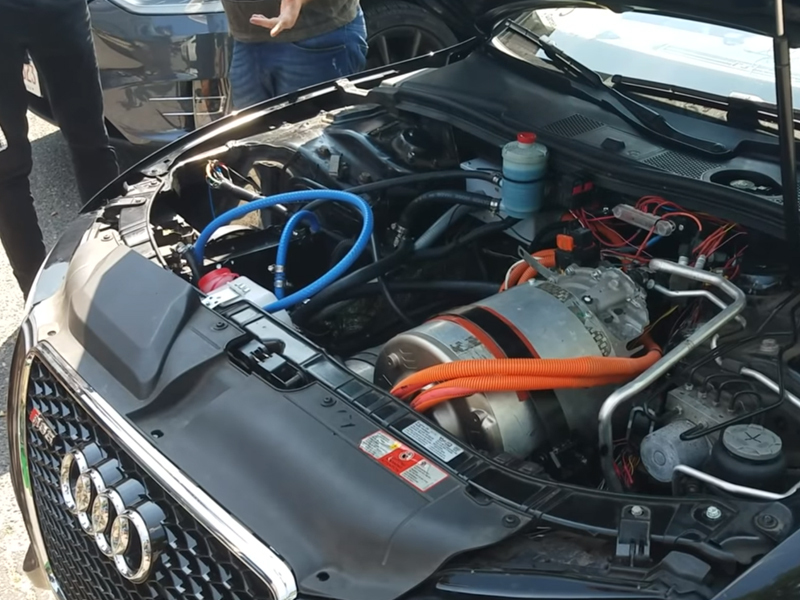 This means that if the car truly was an S5 (and not an RS5 as the grille claims), the car's prior life involved a similarly powered 4.2-liter FSI V-8, just a tad slower from 0-60 miles per hour. A single-motor Model S equipped with an 85-kilowatt-hour battery is rated at around 380 horsepower, while a P85D is rated at 416 horsepower. Sam says that his car isn't quite finished yet, and that can be seen with the few rough-around-the-edges details. And no, the car doesn't have an internet presence either; he hasn't made an Instagram or YouTube channel to showcase the build but plans to in the future. These types of swaps are becoming more commonplace and it's exciting, to say the least. Though many people lose key features that enthusiasts enjoy by moving from petrol to electric, it's not all bad. Electric conversions, as sacrilegious as they may be, will certainly turn heads. And although some may be against the principal at its very core, at least we can agree that it's something different. Have you ever seen a rocket with wheels? Under 2,000 pounds and a sub-3 second 0-60 MPH time—sounds good to us. Elon Musk foresees the company to finally be sustainably profitable with an annual vehicle production of 350,000 units. This electric power plant is the silent victor of the quarter mile.